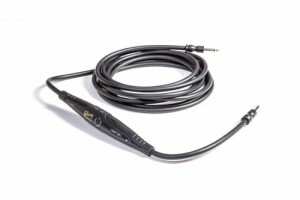 The Monster Standard 100 instrument cable is a great all around budget cable. It is a very simple cable with no frills, and is really aimed at maximizing function per dollar. 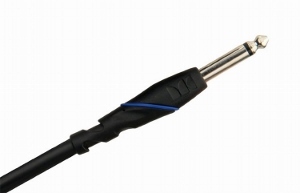 It is a guitar cable that is just as comfortable serving primary cable duty in your lineup as it is serving backup duty. It should speak volumes about this cable that it is the one I use most often at home when playing alone, and I operate a website dedicated to guitar cables! Admittedly, this is in part because I’m not as picky about my sound when I’m alone, and also because I don’t have to take extra steps to take great care of the cable. That said, it still performs well enough for me to enjoy playing on it, and for a fraction of the price as some of the high end music cables. So in terms of construction, the copper shield provides 90% coverage which works to a lower noise floor, resulting in increased clarity. The cable also has “vibration dampening” insulation properties, which works to reduce handling noise. The cable construction allows nice flexibility. Another interesting feature that is really helpful if you have a cable heavy setup is that the Monster Standard guitar cable comes with interchangeable colored rubber bands that stretch around the connectors. This way, if you match both ends, you can easily and quickly find the correct cable if you are sloppy about how you handle your cables(aka you are sorting through a tangled mess). Other than that, the cable is durable, well made, and reliable. To give you an idea, I have had mine for five or six years, and have paid little attention to caring for them. Even in spite of this, they have given me no problems and still perform as well as they did on the day I got them. As far as cosmetics go, they are just black cables with black connectors. No braid on them like the Spectraflex Vintage but they look fine as far as I’m concerned. They can also be had in a variety of lengths. Overall the sound is pretty darn good for a low buck cable. The cable preserves your signal with minimal distortion. Low noise and high clarity are both characteristics of this cable. It provides good highs and lows. Again, it’s not quite as nice as some of the really high end stuff, but I don’t think you will be left wanting for anything. Overall I really have no complaints whatsoever about these cables. I have put them through their paces and they haven’t let me down. I can confidently recommend them. Some will say that Monster Cables are overpriced, and maybe that’s slightly true of their higher end stuff, but as far as this bargain is concerned, it’s simply not the case. If you are aware of a nicer cable for the money, I’d love to hear about it! Click here to read more reviews, check prices, and see more pictures on Amazon.com.